Editor’s note: I love hearing about “ultimate hang’s” from my readers. If you have a trip report showcasing your expertise with hammocks out in the field (or in the home!) please drop me a line. I’d been camping around in the Green Swamp Wilderness Preserve in Florida for some time. There’s a trail I’ve seen many times on my way to and from my usual sites but had yet to explore. It’s always enticing to follow an unknown trail to see where it goes, but with a busy schedule, it’s been hard to dedicate time to really “get lost” in the swamp. The preserve is just northeast of Tampa, just 50 minutes by car. I decided that if I were to do this trip—due to my busy schedule—I’d have to do a quick sub-24-hour, or S24O, trip: quick in, quick out. The weekend I had set aside for my trip started to get derailed. My brother asked if I could help him fix his boat trailer, even though he just bought it and it seemed perfectly fine to me. Working on a boat trailer I wasn’t a task particularly looking forward to, although I was happy to help. I had just resigned to find a new weekend for my S24O, but serendipitously he called with great news. “That’s too bad,” I replied, holding back my excitement in earning a reprieve from the weekend job as an assistant hub mechanic. Saved by the United States Postal Service! Without much delay, I threw together the small amount of gear I would need… my Camillus Carnivore Machete for firewood, the small trivet I use as a fire grill, headlamp, Lodge oversized lightweight sleeping bag, 9’x12’ painters’ drop cloth that I use as a ultra light tarp and a small butane stove for coffee in the morning. I love my hammock. It’s an older model from Byer of Maine the “Moskito”. They’ve updated the design, but I find the old version works better for me. Sleeping in a jungle hammock is really comfortable, and really convenient in a buggy swamp, but as I neared my destination I reconsidered my plans. I arrived at an open field and I could see the dirt road takes a dog leg left ahead of me. I know it ends at McNeil campground eventually, but I’m not going that far. Just after 1 p.m., I figure I’ve come about three miles because I usually walk about two miles an hour with a pack on. I drop my pack and explore the area to find that the tree line starts at the swamp so trees for the hammock might be an issue unless I want to sleep over the water, I have an idea. 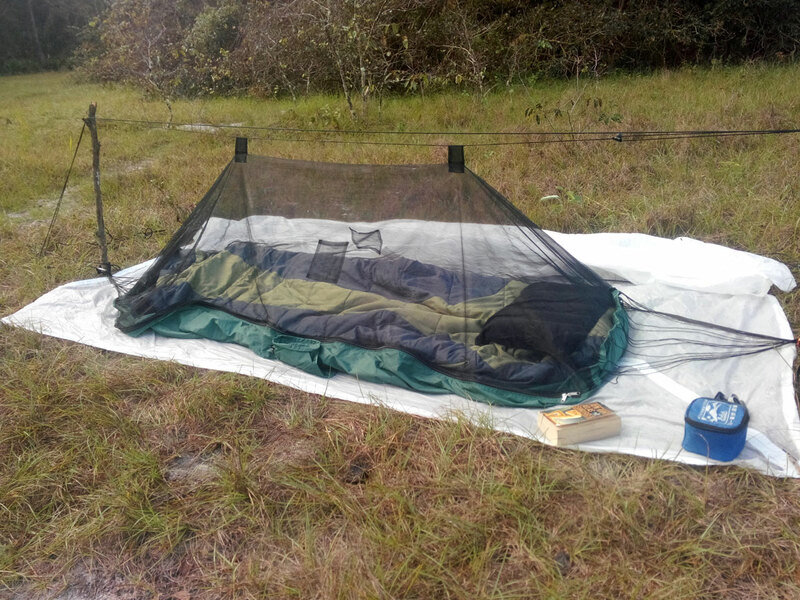 There’s a beautiful field of grass that doesn’t actually have trees big enough for the hammock and I don’t fancy sleeping in the swamp even if the hammock does have a built in mosquito net. Trees also tend to block the amazing, panoramic view of the night sky. A view that makes one utter, “I can’t believe how many stars there actually are.” A view that makes the four inch screen on my cell phone seems a tad paltry. I remember camping with a friend’s family once and the amazement on the kids faces when they were told the little blinking lights that moved slow slowly across the sky were actually satellites. Mom later confessed to me that this led to a lot of goggling when they returned home and she was forced to learn a few things she didn’t really want, or need to know. On to the task at hand, cleaning the sleep area of twigs and then checking for any nests of biting/stinging wildlife that might be upset that I’m sleeping on their home. Clearing out a small area for the fire and determining where the sun will rise so it won’t shine in my face when I want to sleep in. A quick browse through the area yields enough small branches to make all the tent pegs I’ll need. A few yards of cordage and a couple of sturdier branches will provide the uprights I’ll need to secure the mosquito net and the apex of the tarp. After a great meal and a little clean up, the next item on the agenda is to reserve my front row seat for the upcoming twilight movie that will be taking place over my head. I reserve my seat by finding a perfect patch of comfy grass and once again press my backpack into use as a recliner. With all the arrangements made I settle in to nature’s easy chair and see how many satellites I can spot in one night. A quick glance over at my phone to ensure no LEDs are blinking and that the phone is actually turned off, I hate when a cell phone disrupts the movie. While it was a quick trip, I felt more than reimbursed for my investment. As expected, there was dew collected on the tarp, so I’m glad I pitched it before going to bed. I’m not a big breakfast eater but I do like, and mostly need, coffee in the morning so out comes my small propane stove and not soon after a big mug of hot coffee is helping ward off the very brief morning chill. As I leisurely start my packing up routine, I drape the tarp over some bushes to let it dry and notice a swallow-tailed kite weaving through the trees as it hunts dragonflies or lizards or any other creature that looks appetizing. With all my gear packed up and the trash in a bag to be packed out I throw on my backpack and immediately notice the weight difference since I have consumed all the food and most of the water. It’s a little after 10 in the morning and the sun has cleared the trees, I can almost see the steam rising off the grass as the blades warm and shed the dew. I have a nice mid morning hike ahead of me up the path to the car park and should be back in the lot before noon. While hammocks offer a comfortable night’s sleep, suspended off the ground, occasionally it makes sense to “go to the ground.” Thankfully, jungle hammocks make this a viable option with the built-in bug net. It’s handy to have the ability to go to the ground without needing extra gear. Awesome. AFAICT this works if your hammock entry is on top of the hammock. Where I backpack there are lots of spots to camp with no trees so doing something like this is a necessity. You could do this with a bottom entry hammock like the Hennessy. It’s just less convenient to enter. I am trying to imagine getting into a bottom entry hammock on the ground in the night with a mattress and a sleeping bag inside while it is raining. Does this work well ? It’s really not too difficult. When you put a hammock on the ground, you have to think more bivvy sack than tent. The hammock acts more like a bug net cover — you still need a tarp for rain protection. For a bottom-entry Hennessy, I would recommend setting up the foot end / entry side as the head end on the ground. Hennessy has a great set of photos and a video that show how this works. My big hammock bug net has a mid zip entry and weighs 1 lb. It hangs the same way, but my hammock is separate, so it can be used or not. 100% bugless for $15 from a China vendor on ebay. I have the same old Byer Moskito that I bought for $20 years ago. I use it at least once a year for 10-14 nights when I visit my mother in Caracas. It’s a delight to hang on the covered balcony. I usually wrap myself up in blankets as I haven’t taken an UQ. Planning to take my new Klymit inflatable pad next month (October 2018) tho I might end up taking my Arrowhead Jarbridge summer UQ as the Klymit is pretty huge. I’ve inflated it (with the expensive $25 pump) but have yet to try it with the new hammock I got from Amazon for $30. It’s a 10’ Moskito lookalike. I think the Klymit hammock pad is way overpriced at ab $140 but I bit for the “used like new” from Amazon Warehouse for ab $99.